Milk thistle (Silybum marianum) has a long history of use in liver disease. A report in the current issue of HerbalGram highlights its effectiveness in one of the worst, most acute cases of liver damage: that which occurs from ingesting the deathcap mushroom, Amanita phalloides. A proprietary intravenous administration of milk thistle has been approved and used in Europe for some time as an effective antidote to this poisoning; in the United States, such approval is lacking and thus no effective antidote exists. As the Santa Cruz Sentinel reports, six people who ate deathcap mushrooms over New Years 2007 were rushed to the local hospital, where the doctors, in a desperate search for something that could help reverse the rapid destruction of their patient's livers and thus save their lives, came across milk thistle as a proven antidote. Unfortunately, the herbal medicine was unapproved by the FDA. 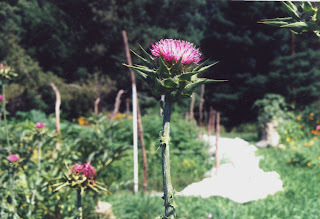 Not willing to give up, the doctors petitioned the FDA for an emergency IND (Investigational New Drug) status for the milk thistle extract, and in the interim gave the patients oral silymarin from a natural foods store. The FDA granted the request, and the IV extract was immediately shipped from Europe. Five of the six patients had a complete reversal of symptoms, their lives saved. The sixth, a woman 83 years old, succumbed to kidney failure. Even still, Dr. Mitchell (the attending physician) commented that "...her liver function was improving because of her treatment, and unfortunately factors other than her liver resulted in the final complications". This simple remedy does not need to be administered intravenously except in the most dire circumstances, as in this case. For most diseases involving liver damage and inflammation, the oral intake of crushed milk thistle seed (1 to 3 TBS daily) is more than adequate for hepatic protection.